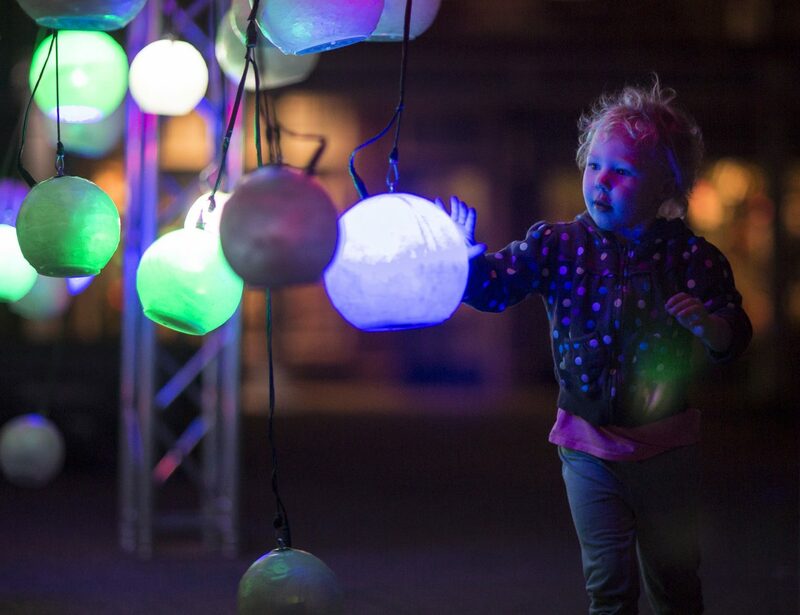 Oaklee Emore, 3, interacts with a suspended globe during the BreckCreate's WAVE festival at the Blue River Plaza Thursday June 1, 2017, in downtown Breckenridge. 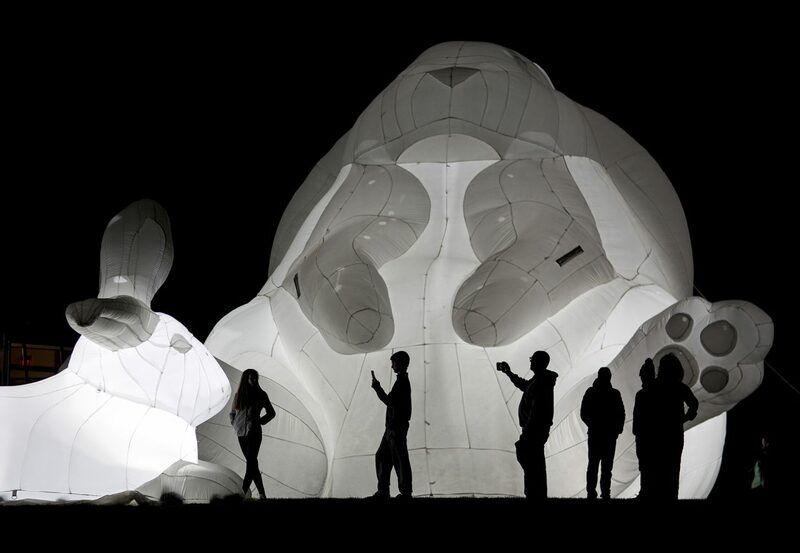 A toddler gets up close to a giant illuminated rabbit, the "Intrude" installation by Amanda Parer, of Australia, during BreckCreate's WAVE art festival along Washington Ave. June 2, 2017, in Breckenridge. 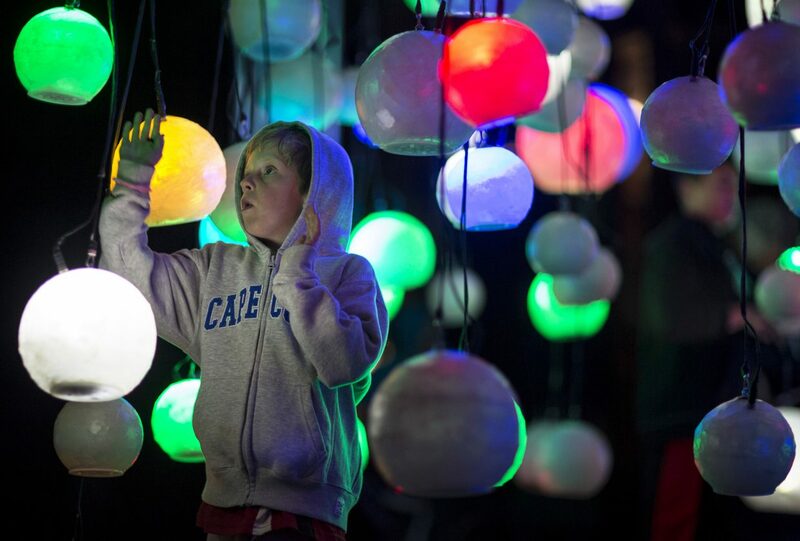 A young visitor interacts with suspended globes during BreckCreate's WAVE festival at the Blue River Plaza Thursday June 1, 2017, in downtown Breckenridge. 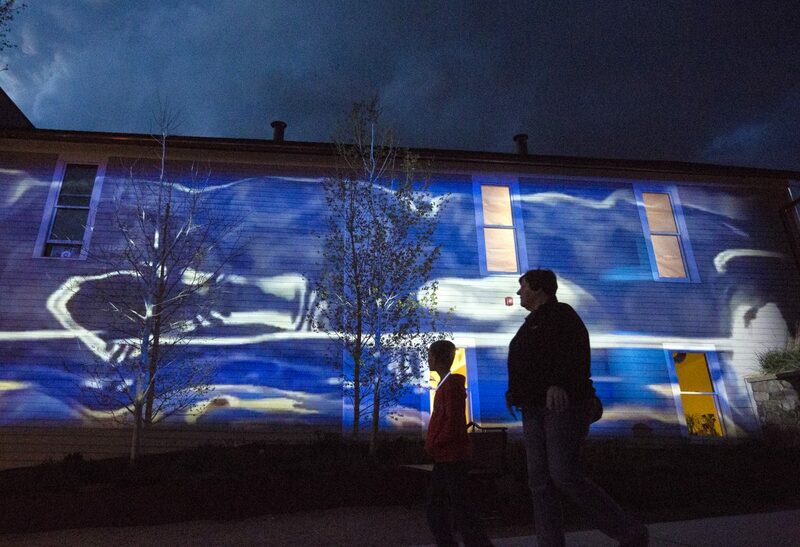 Pedestrians walk past the moving digital projection against the Old Masonic Hall exterior wall, an art piece by Andrew Wade Smith of Portland, Oregon, along Washington Ave. during BreckCreate's WAVE art festival June 2, 2017, in Breckenridge. 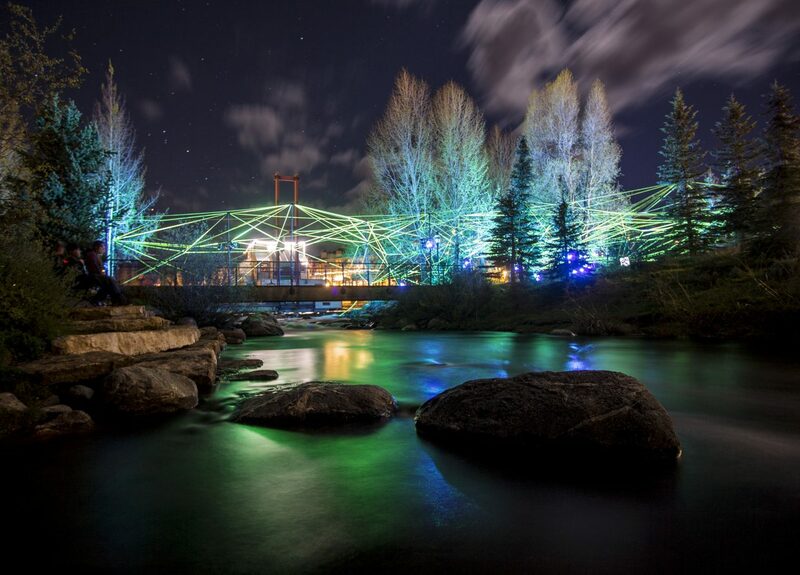 Ropes of multi-color LEDs is illuminated along the Blue River in Breckenridge, for the "Polygonum 2.0" art installation by Tom Dekyvere, of Belgium, during BreckCreate's WAVE art festival June 2, 2017. 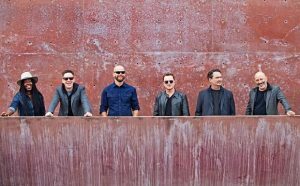 The exhibition of cutting-edge works of contemporary public art featuring illuminated sculptures and projections will be on display until Sunday night. 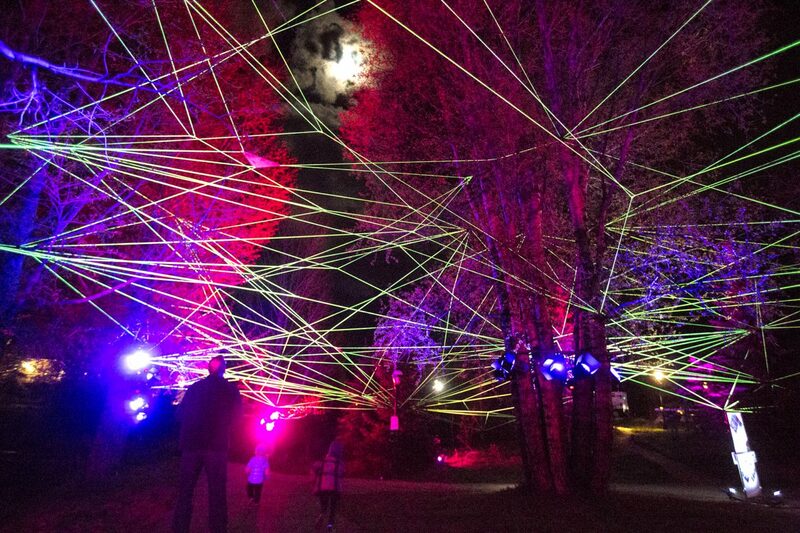 Ropes of multi-color LEDs is illuminated north of Dredge Pond, the "Polygonum 2.0" art installation by Tom Dekyvere, of Belgium, during BreckCreate's WAVE art festival June 2, 2017, in Breckenridge. 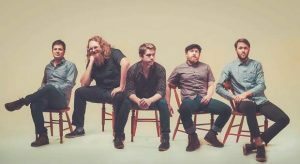 Visitors enjoy the sights of BreckCreate's WAVE festival at the Blue River Plaza Thursday June 1, 2017, in downtown Breckenridge. 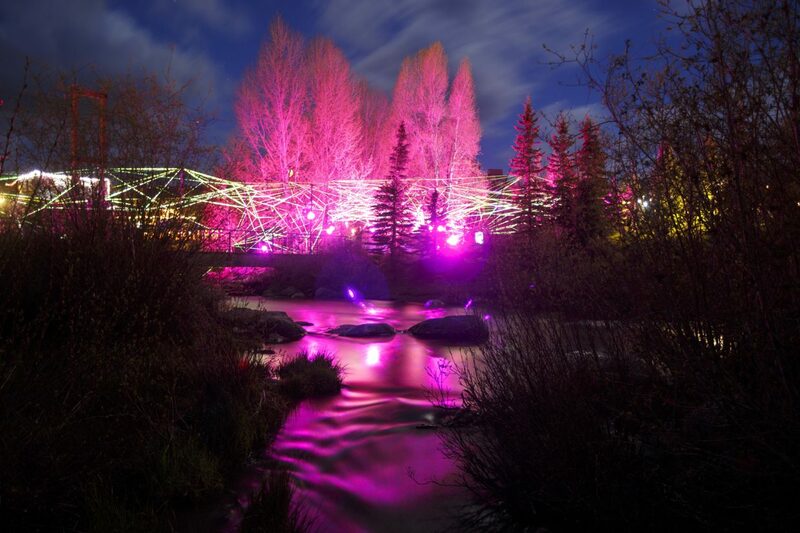 Ropes of multi-color LEDs is illuminated along the Blue River, for the "Polygonum 2.0" art installation by Tom Dekyvere, of Belgium, during BreckCreate's WAVE art festival June 2, 2017, in Breckenridge. 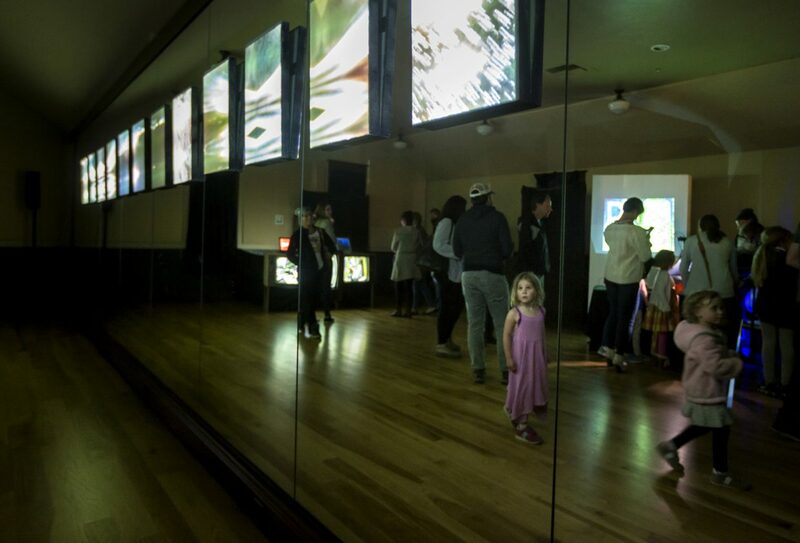 Visitors, young and old, check out the "Luminous" installation inside the Old Masonic Hall, by artist Sophia Dixon, during the WAVE art festival June 2, 2017, in Breckenridge. 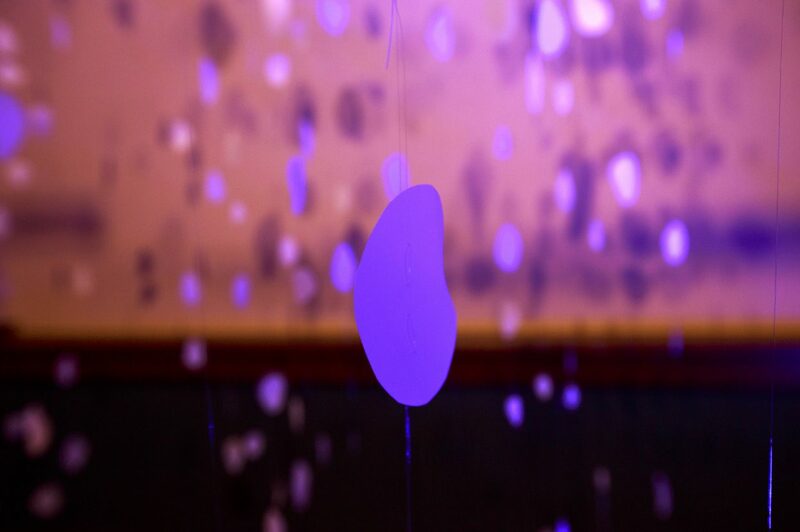 A dura-lat film paper is hung by fishing line in part of "Suspended Light" art installation by Jane Guthridge inside the Old Masonic Hall during the WAVE art festival June 2, 2017, in Breckenridge. 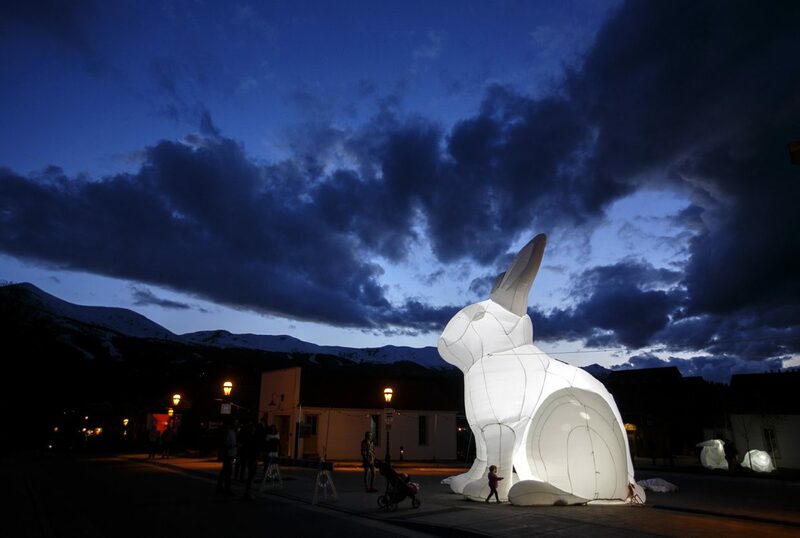 One-hour past sundown on Friday night, the illuminated public art pieces at the Blue River Plaza in Breckenridge begin to take over the darkened sky. The visitors take notice with their phone cameras. The WAVE art festival assembled artists from around the globe to make the town’s public spaces into their canvas. Hosted by Breckenridge Creative Arts, the late-evening families interacted with the light and sounds at the “Micro” installation featuring 200 silicon-coated orbs suspended in midair, watched in awe under 10,000 feet of translucent rope at the “Polygunum 2.0” scene, and walked between other installations within downtown area. 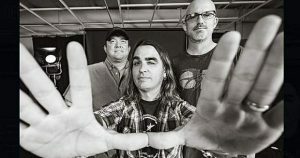 The free contemporary public art event will be on display until Sunday night.